Mid 13th-century St. Albans is crucially important in the history of English illuminated manuscripts thanks primarily to the works of Matthew Paris, a monk of the abbey. 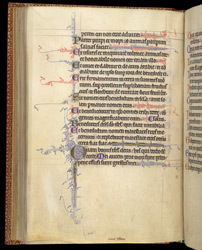 Many manuscripts have been--probably wrongly--attributed to the abbey by comparison with Matthew's style and technique; this psalter is therefore important because its claim to be a St. Albans product (based on the calendar, litany, and early ownership by a St. Albans monk) is secure. For no apparent reason, this page is decorated more lavishly than other text pages: the verse initials are alternately gold and blue or blue and red, and the Psalm initial (Psalm 72) is gold with especially elaborate penwork flourishing. At the lower edge of the leaf are catchwords.